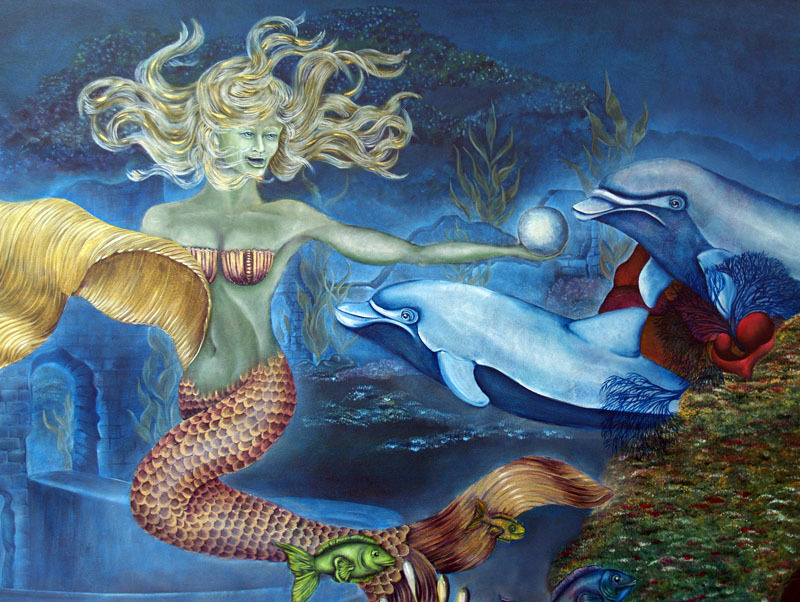 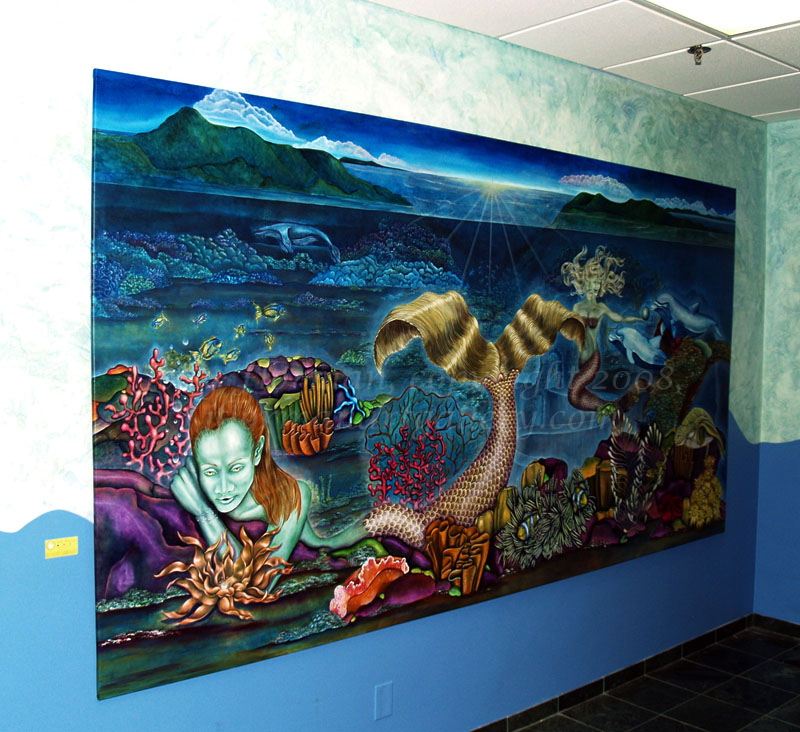 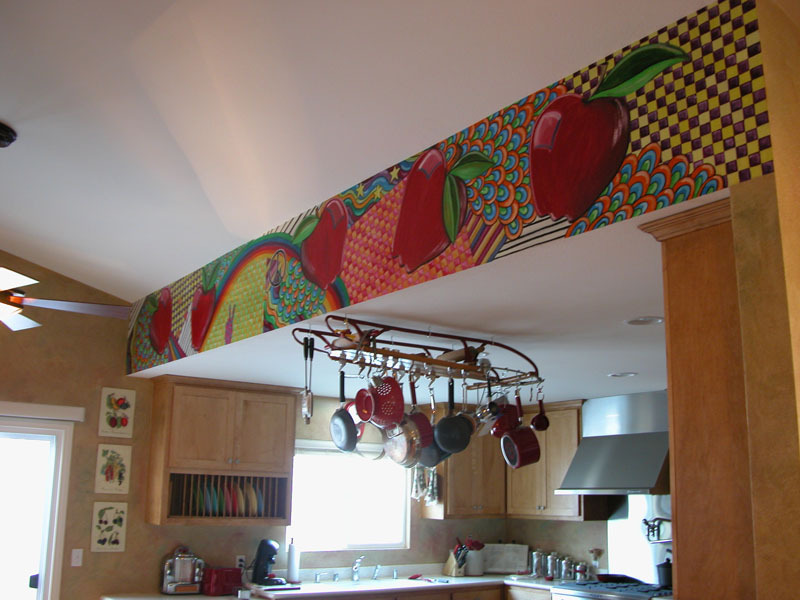 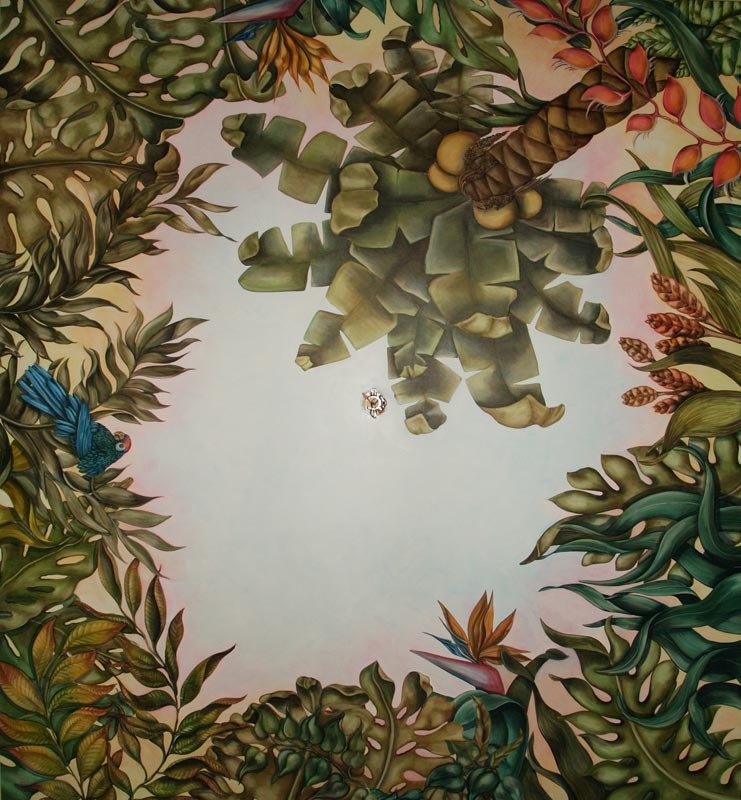 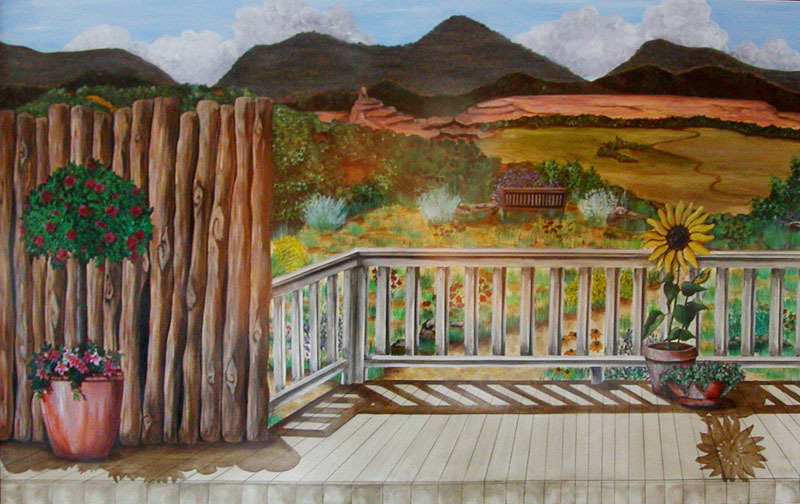 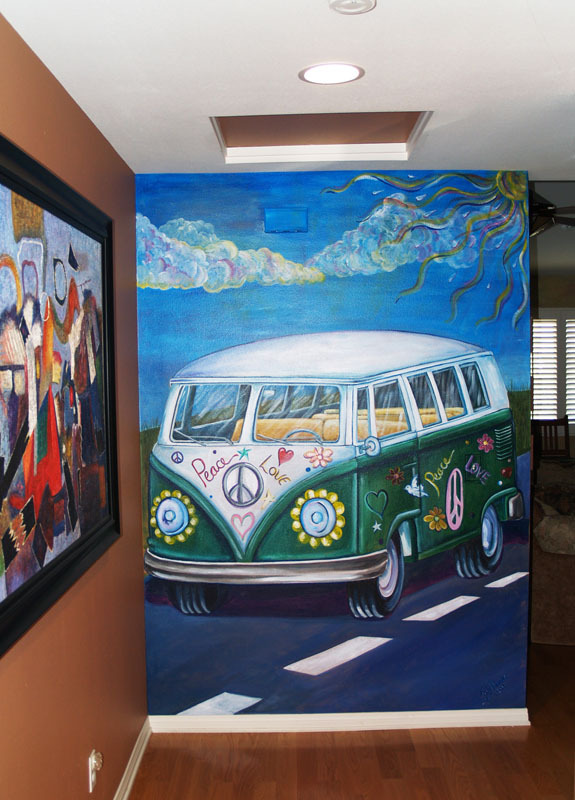 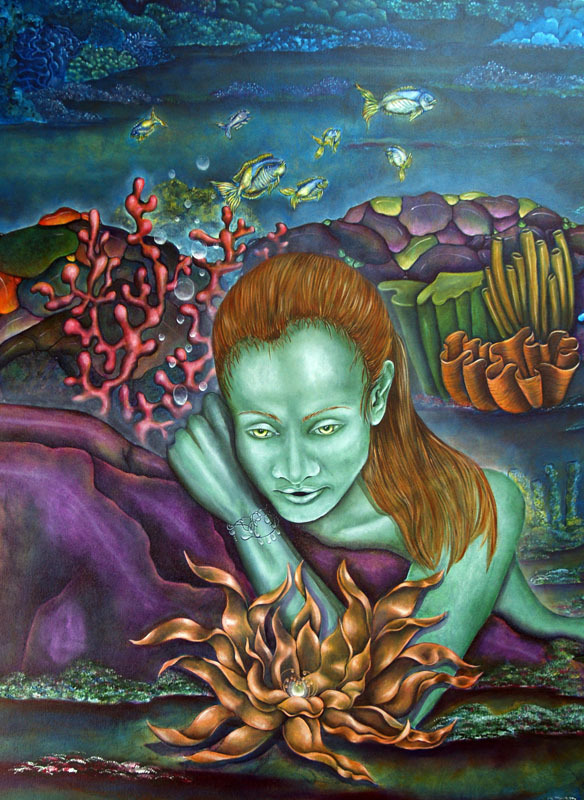 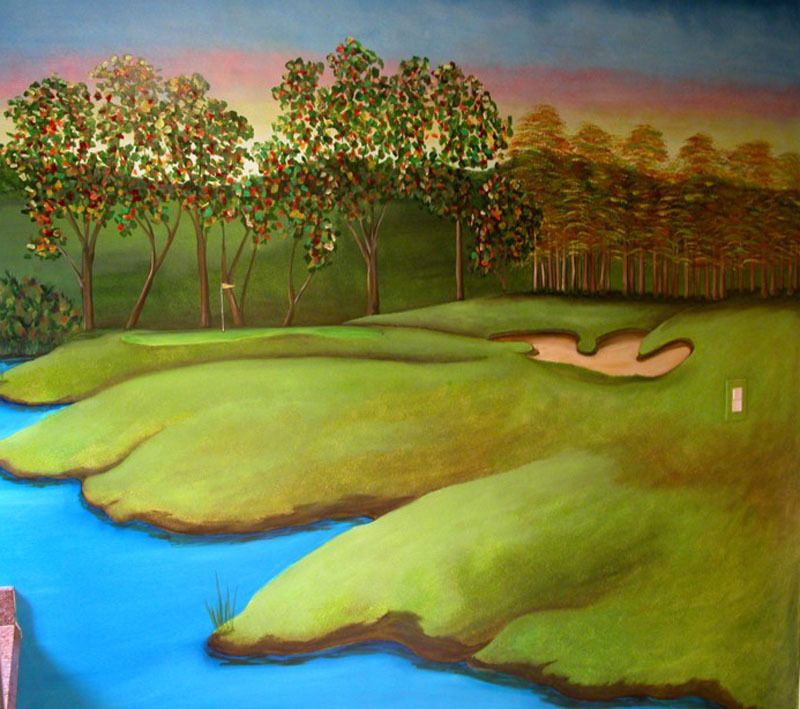 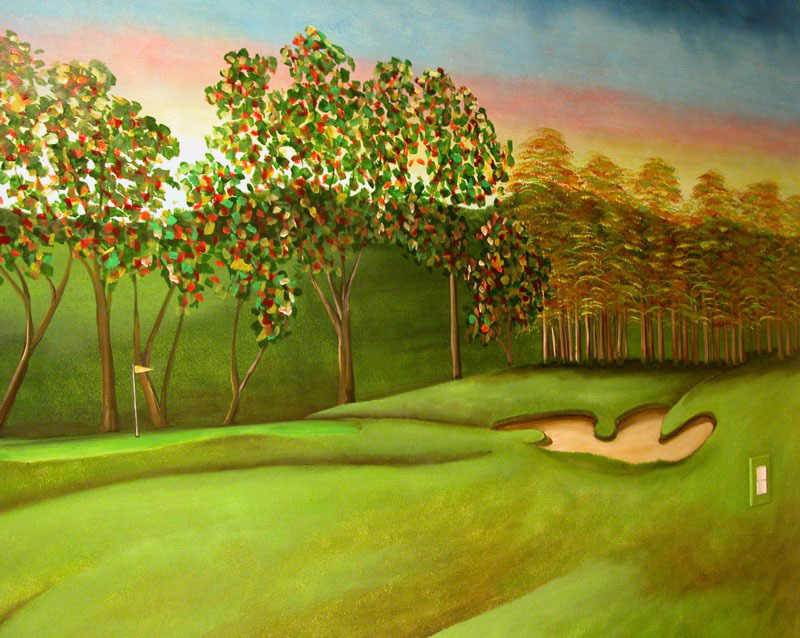 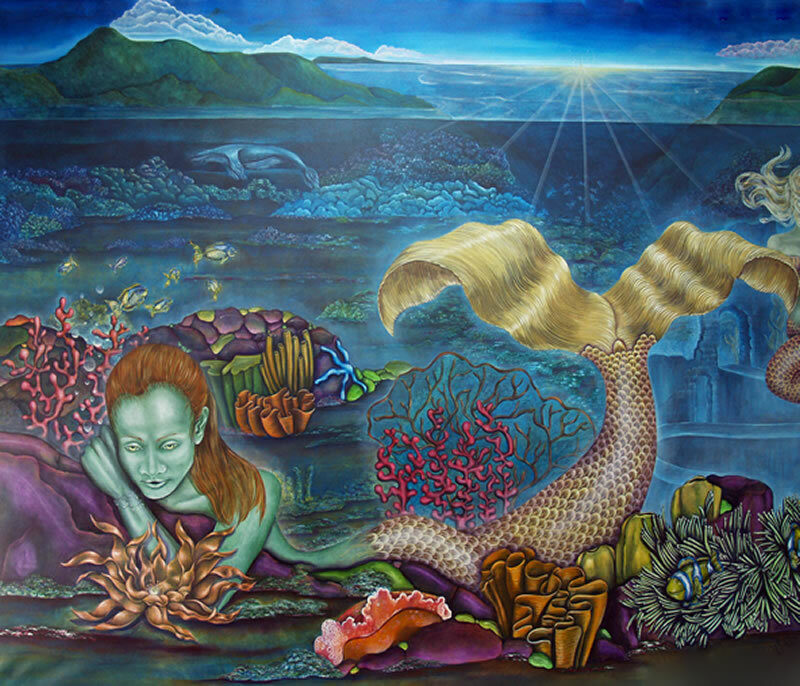 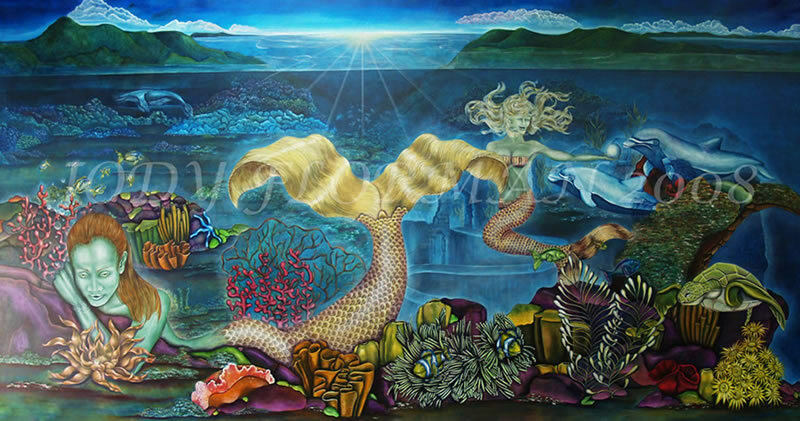 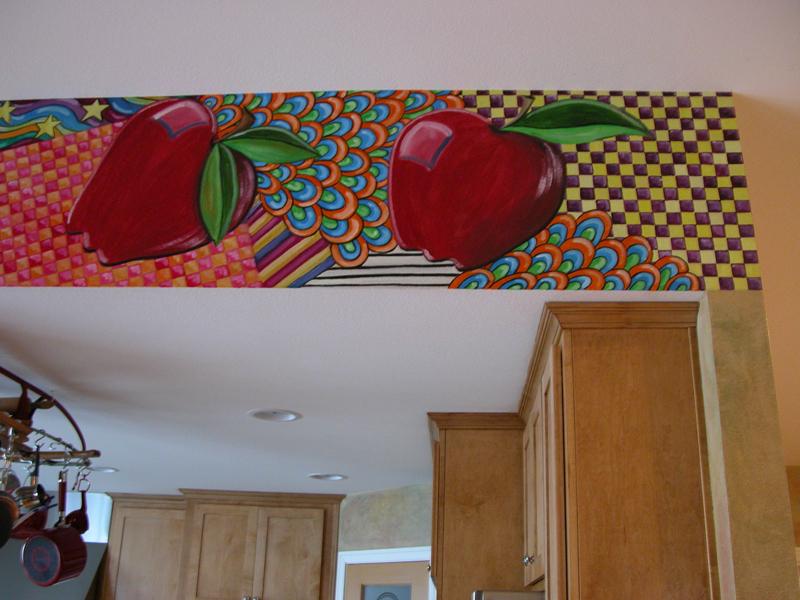 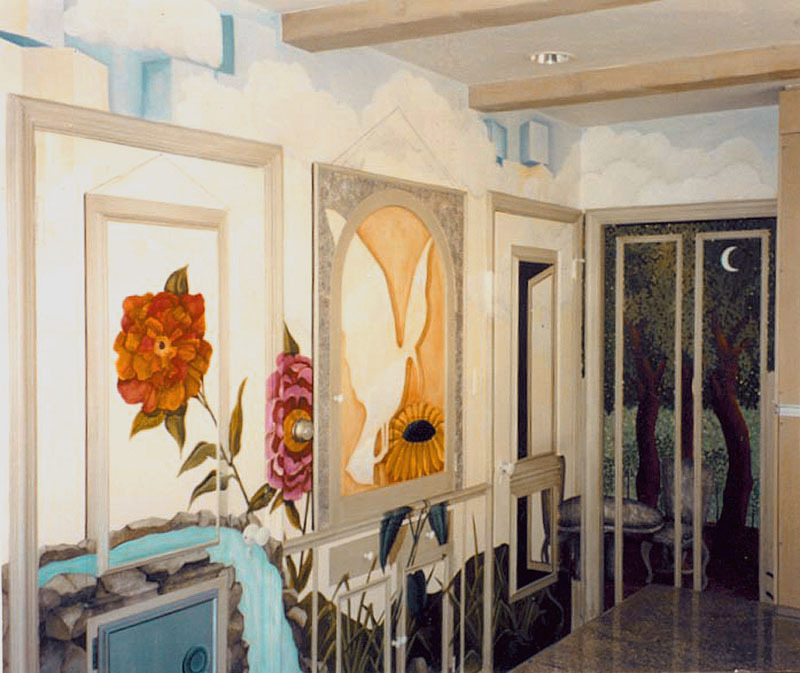 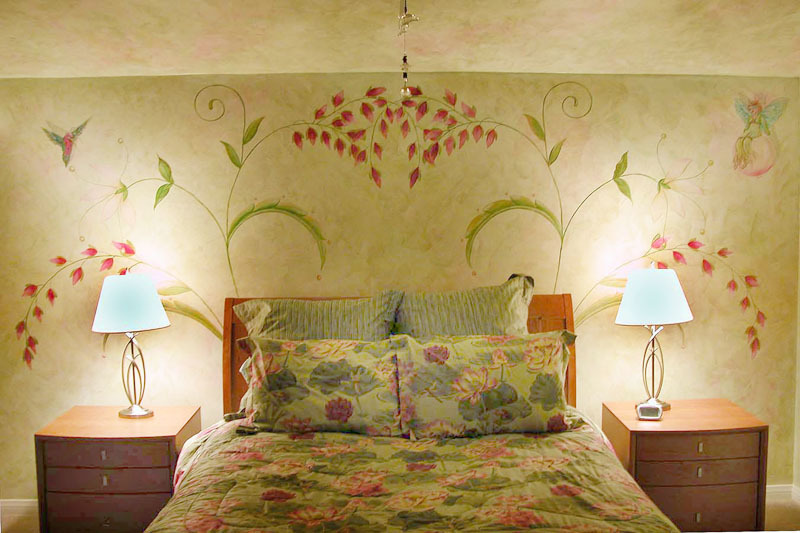 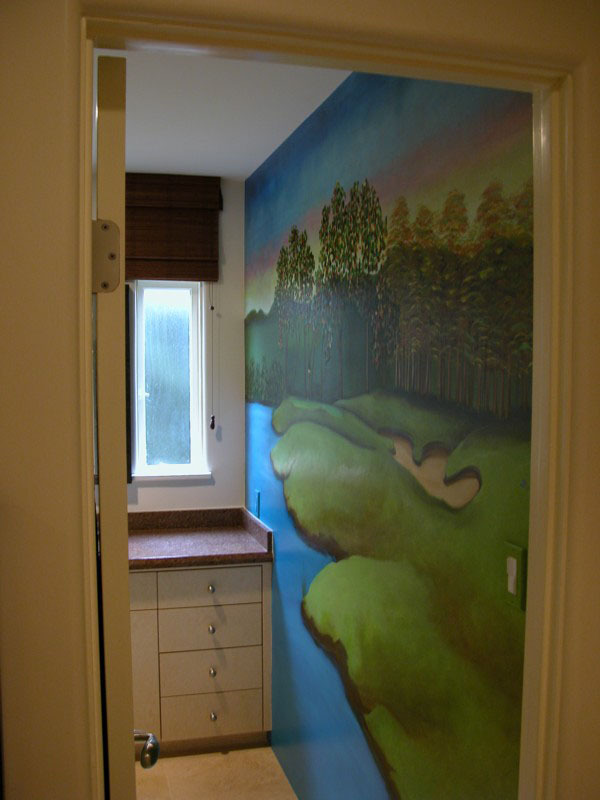 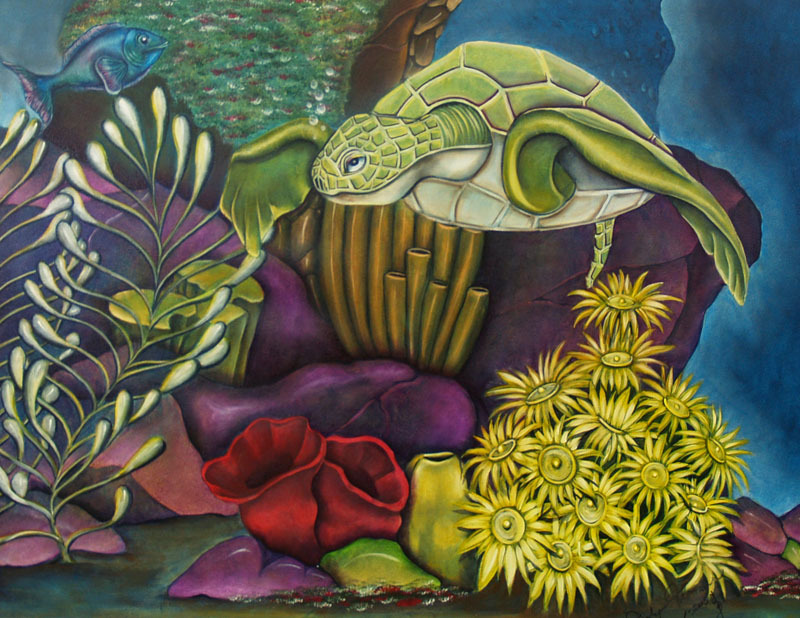 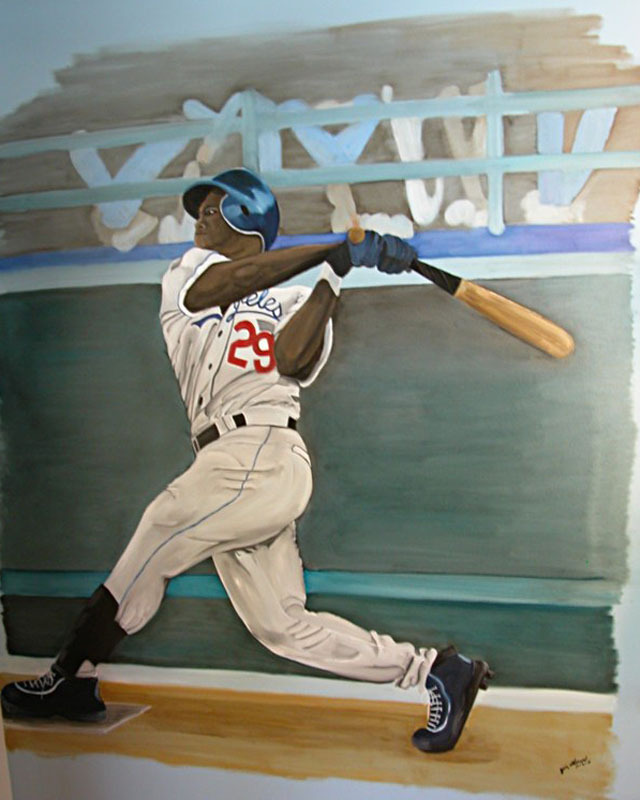 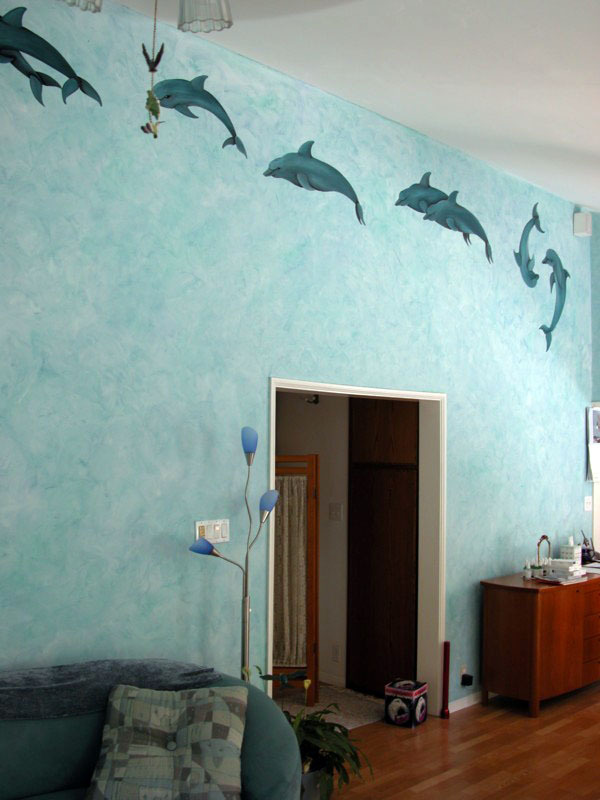 Murals are a way to bring a bit of larger-than-life fantasy to areas inside and outside of your home or business. 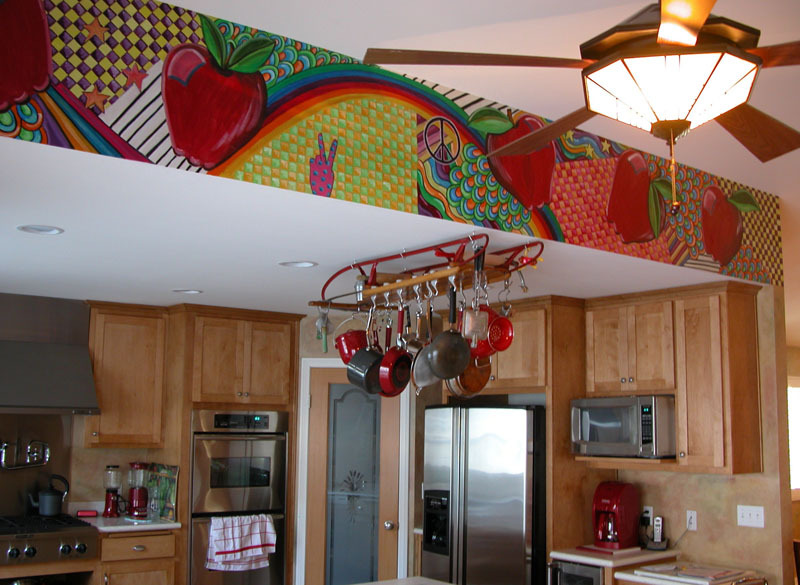 Whatever you can imagine can be designed and painted for you, bringing a sense of fun and wonder into your home or office environment. 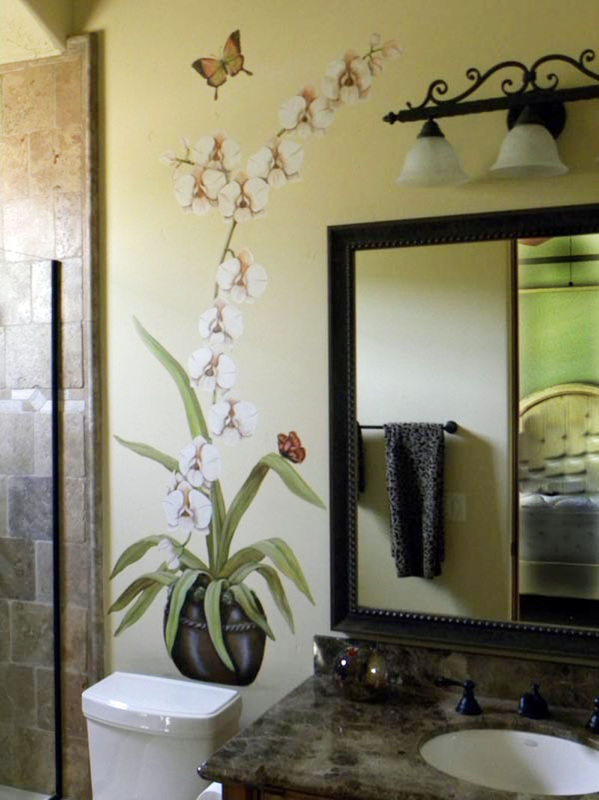 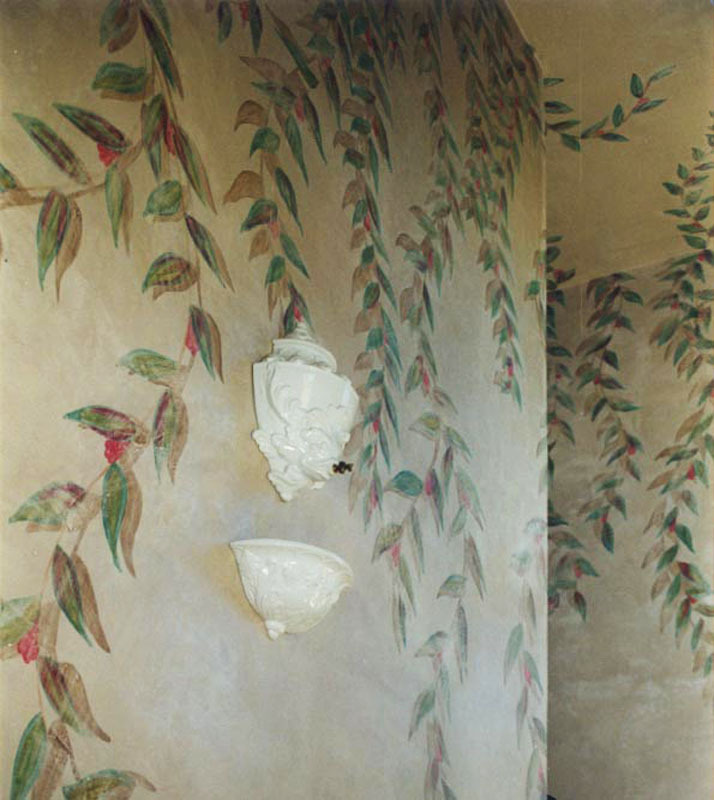 A spray of orchids is painted on the wall behind the toilet. 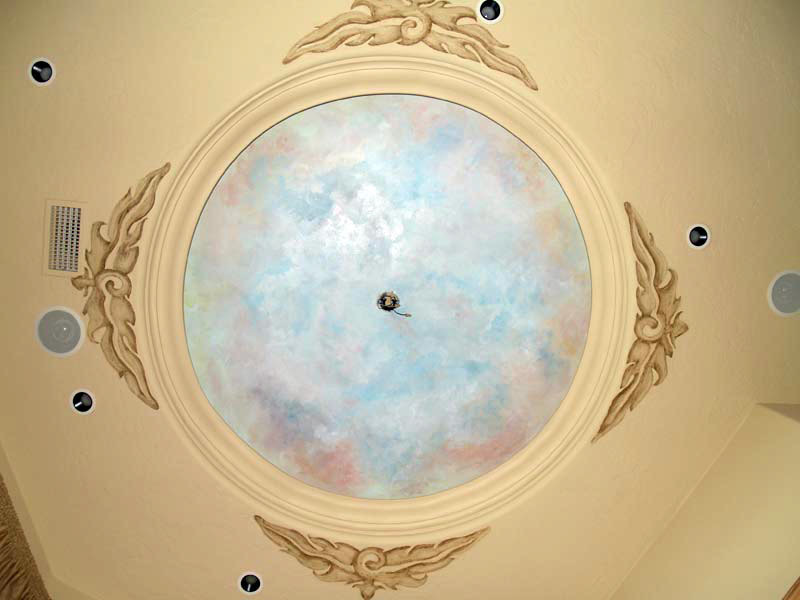 Sky and clouds fill a recessed office ceiling. 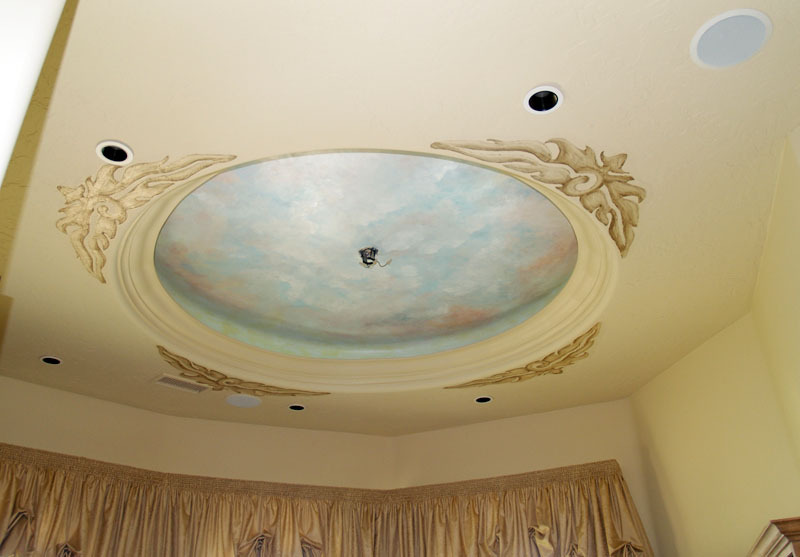 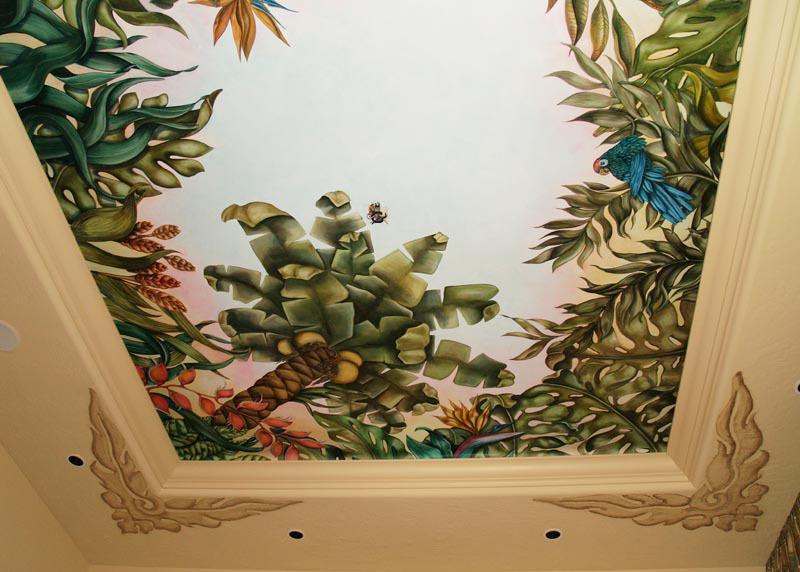 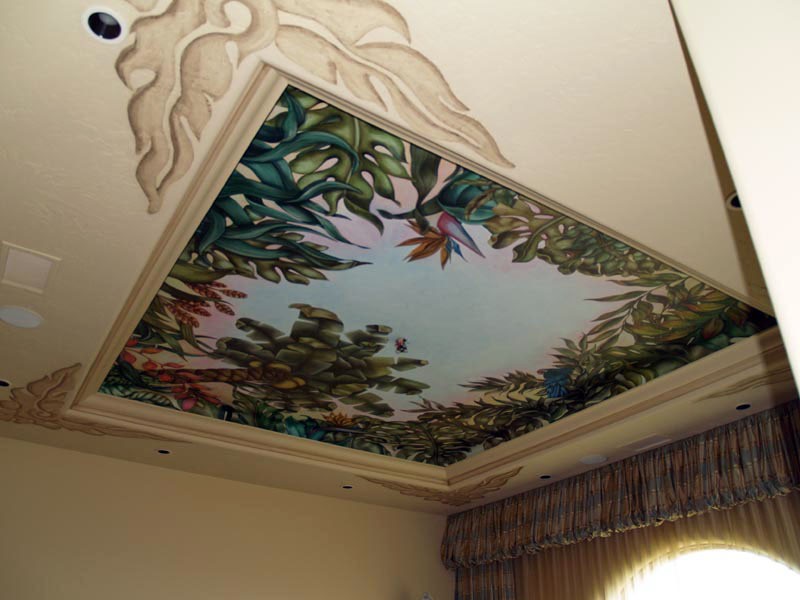 Raised stenciled embellishments frame the ceiling. 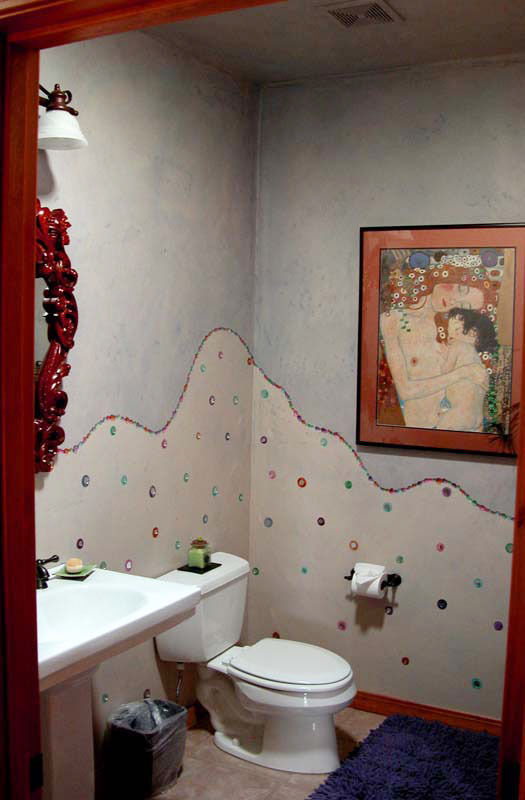 East Indian fabric inspired the pattern on the lower half of in these powder room walls. 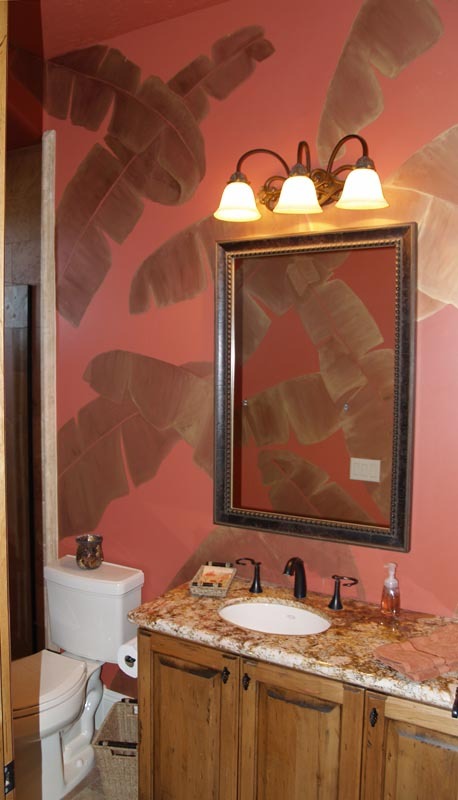 Small circular mirrors enhance the pattern. 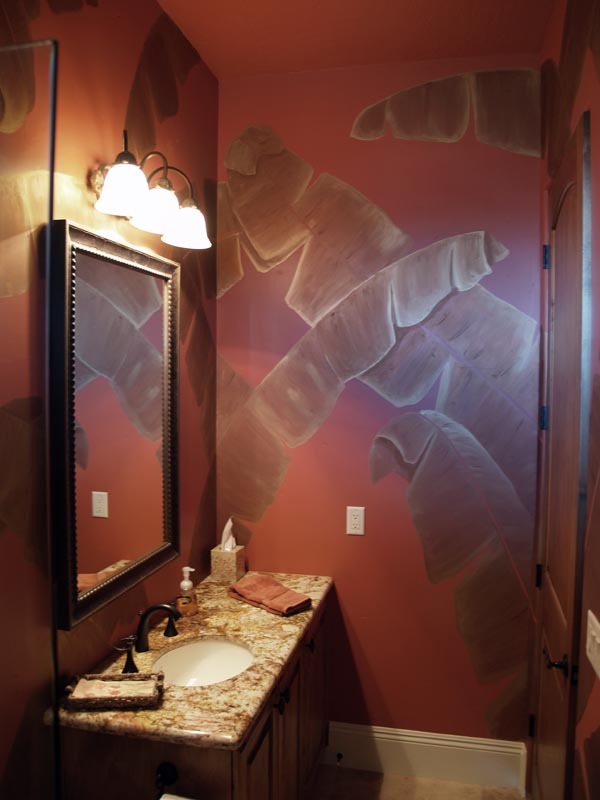 Powder room walls hand painted with banana leaves in metallic colors. 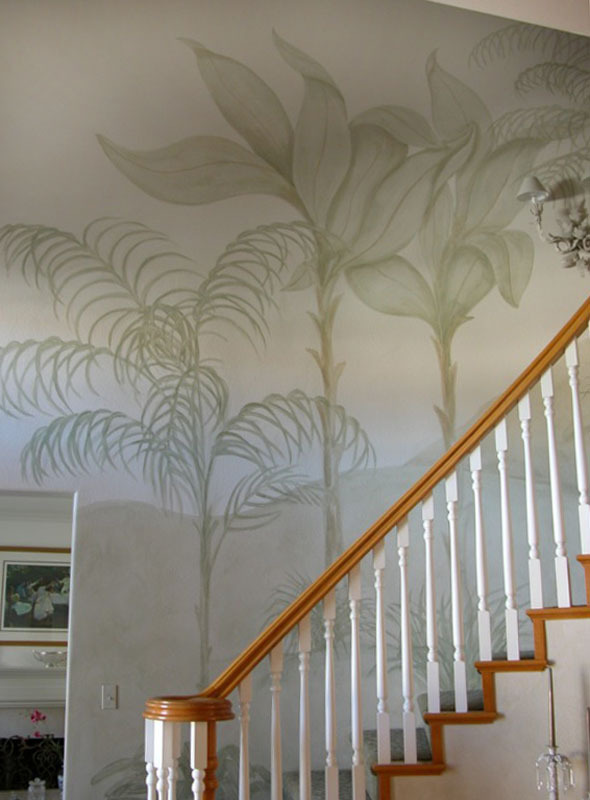 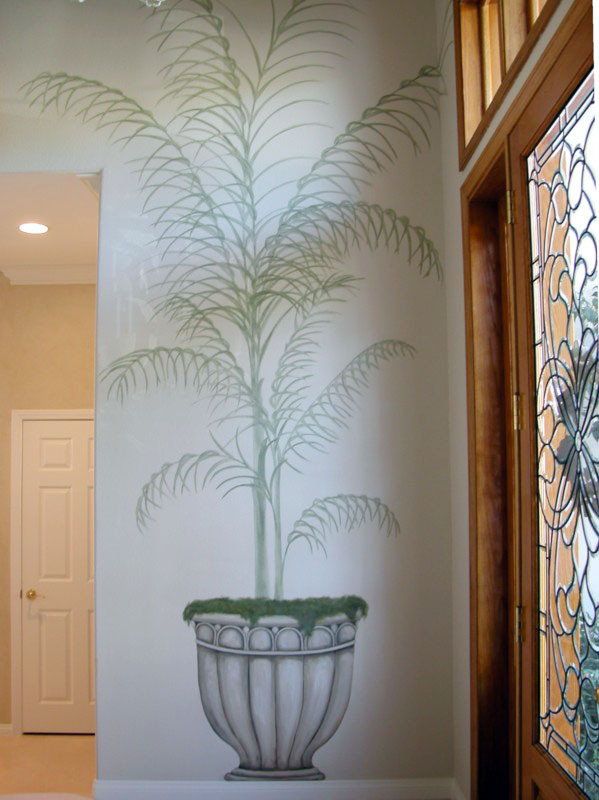 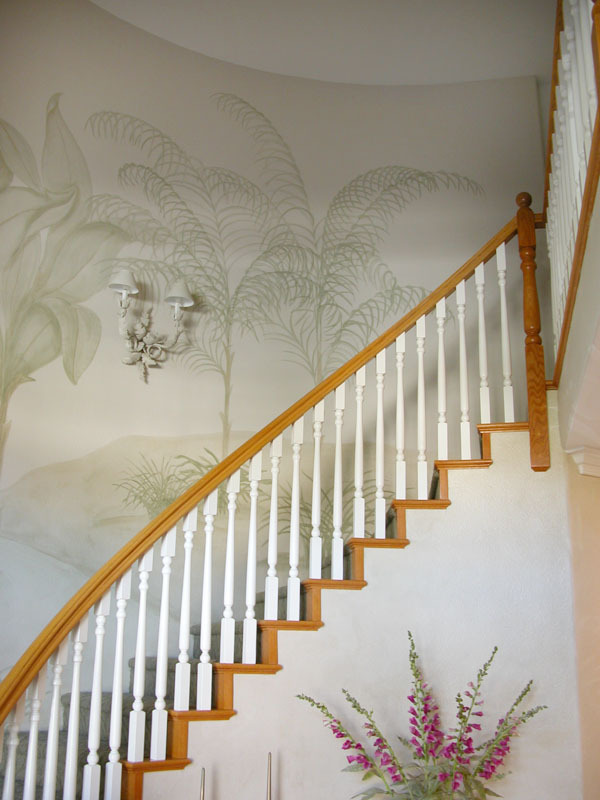 Entryway walls hand painted with palms trees. 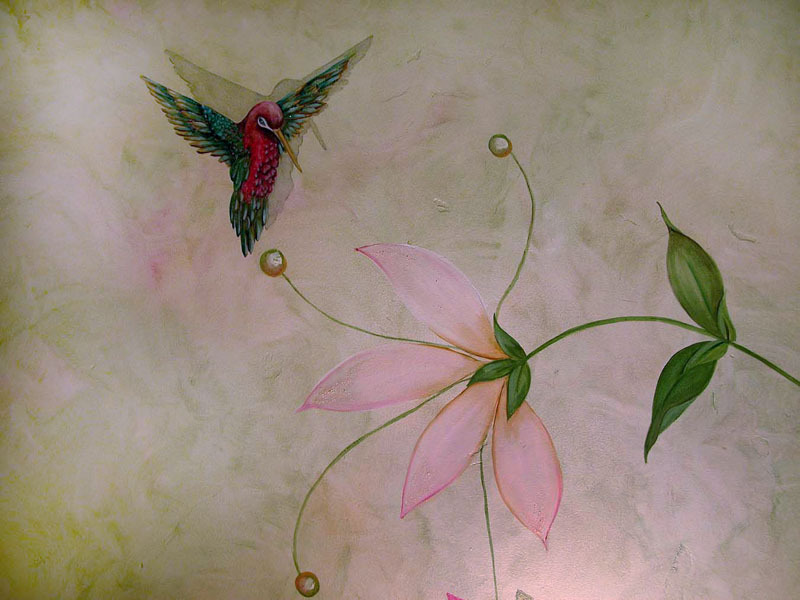 Mural detail- a larger than life sized humming bird. 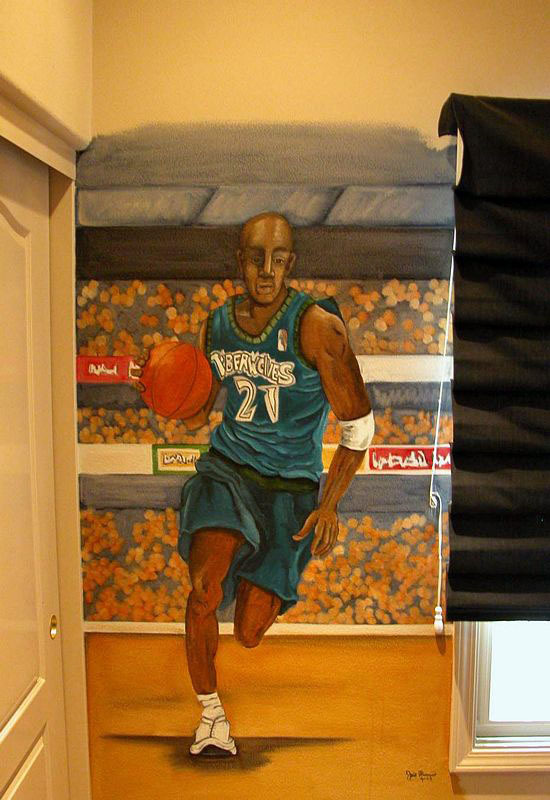 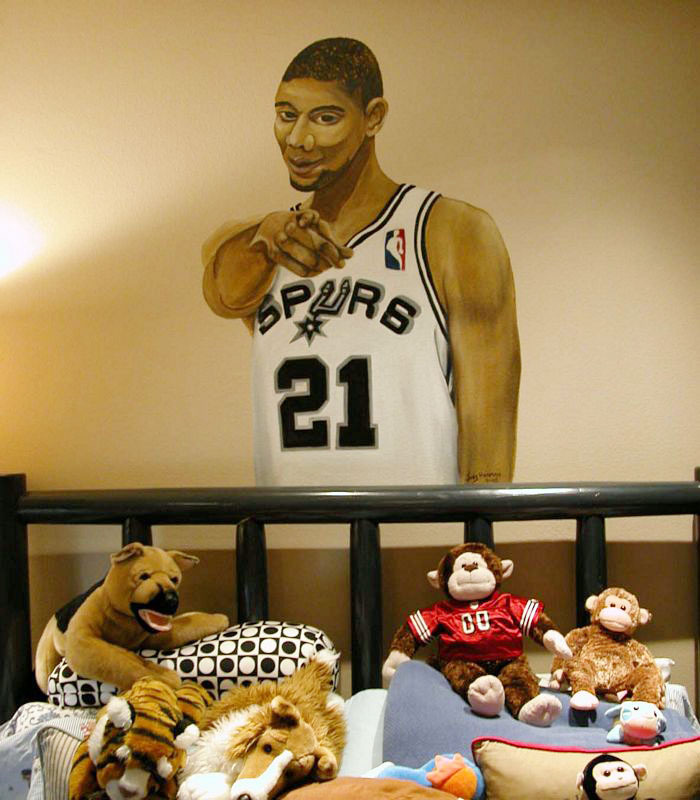 Basketball player painted on a boys bedroom wall. 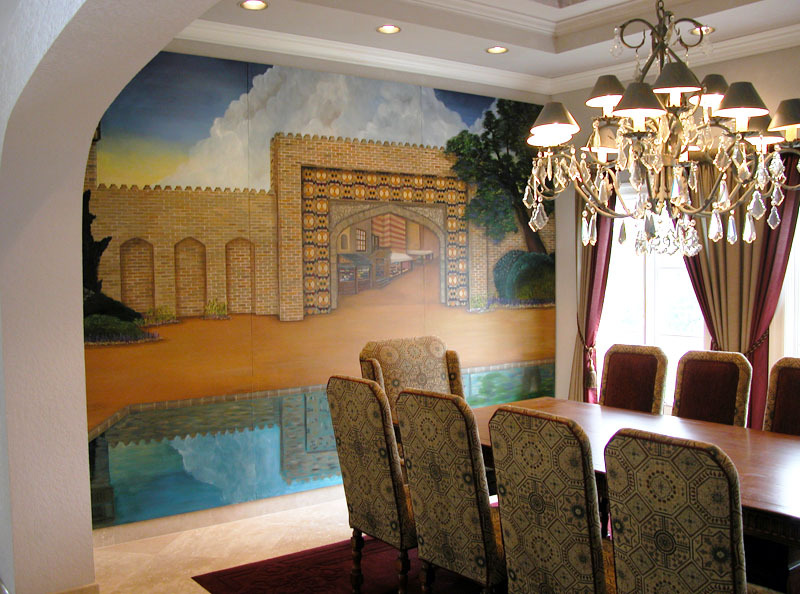 Life size. 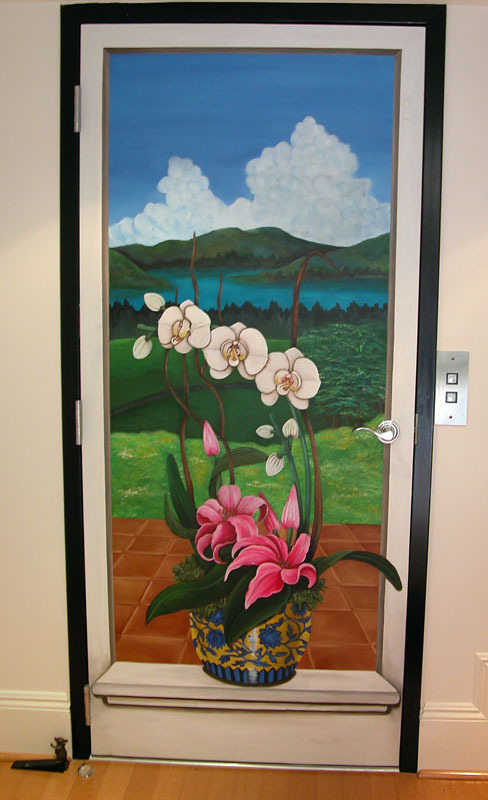 Bowl of orchids sitting on a window sill, decorates this elevator door. 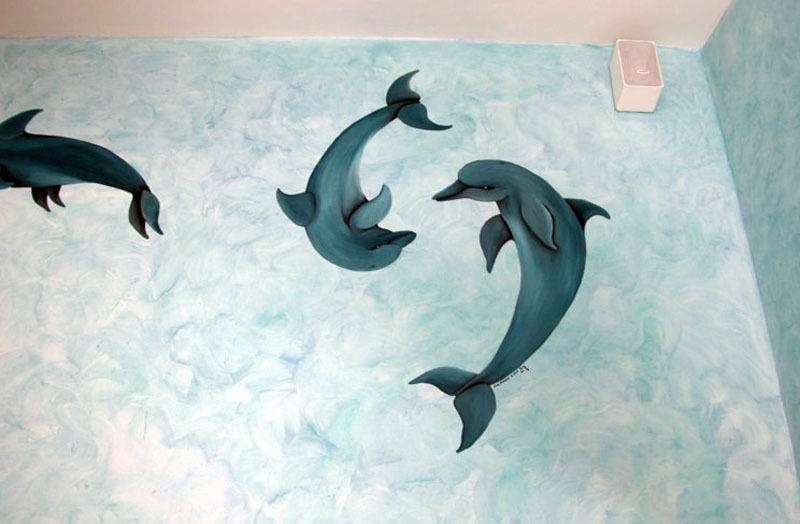 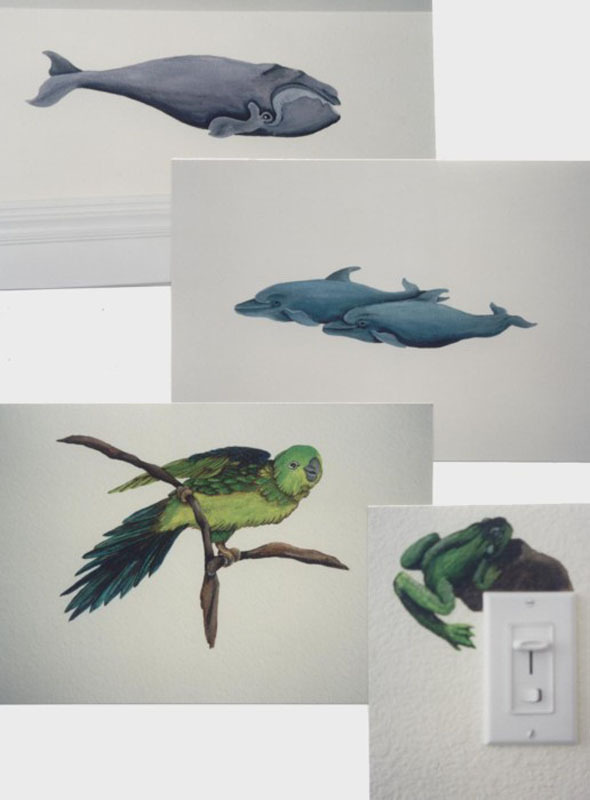 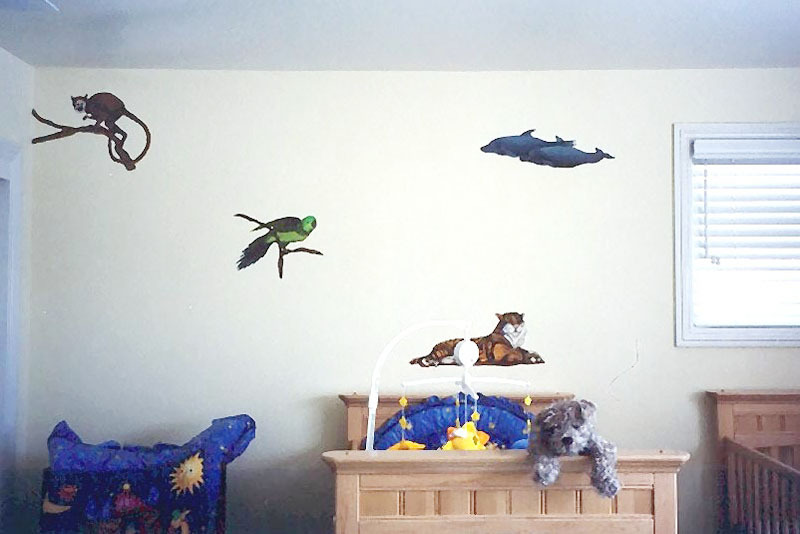 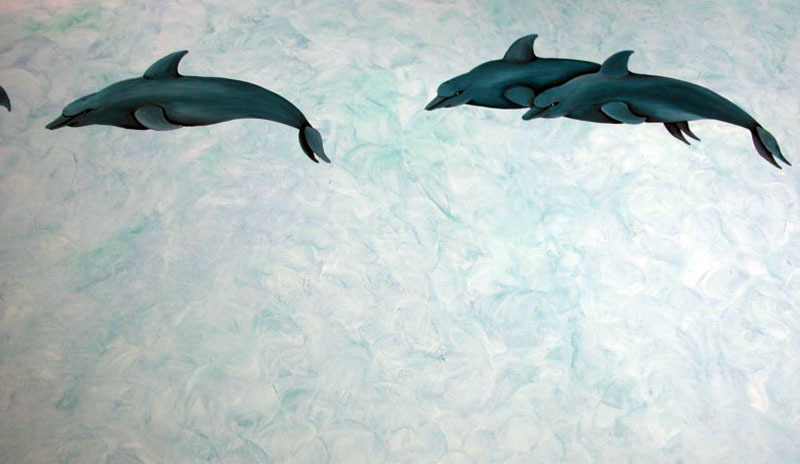 A series of animals painted randomly around the room of twin boys. 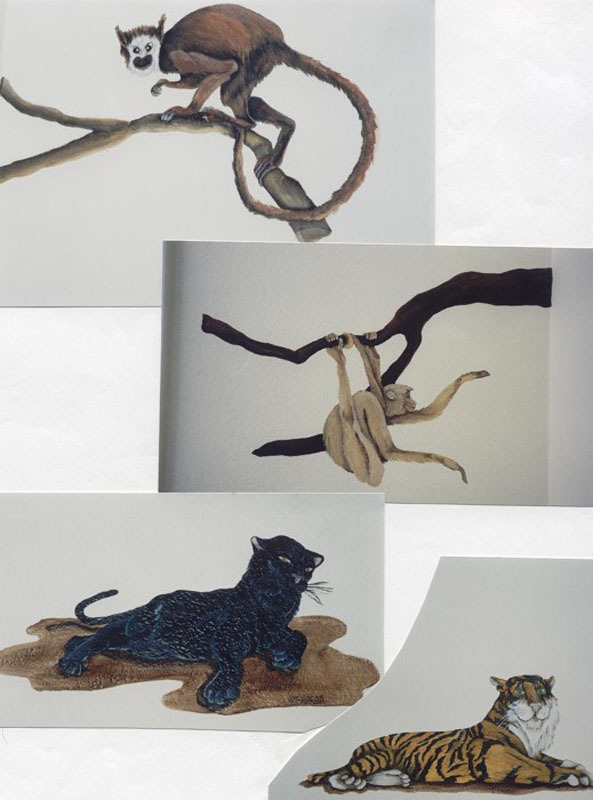 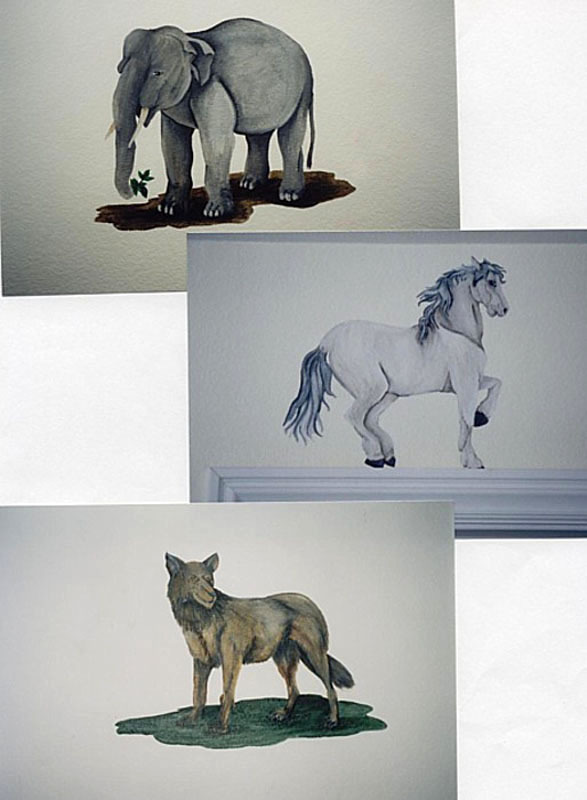 A series of animals painted randomly around the room of twin boys, detail. 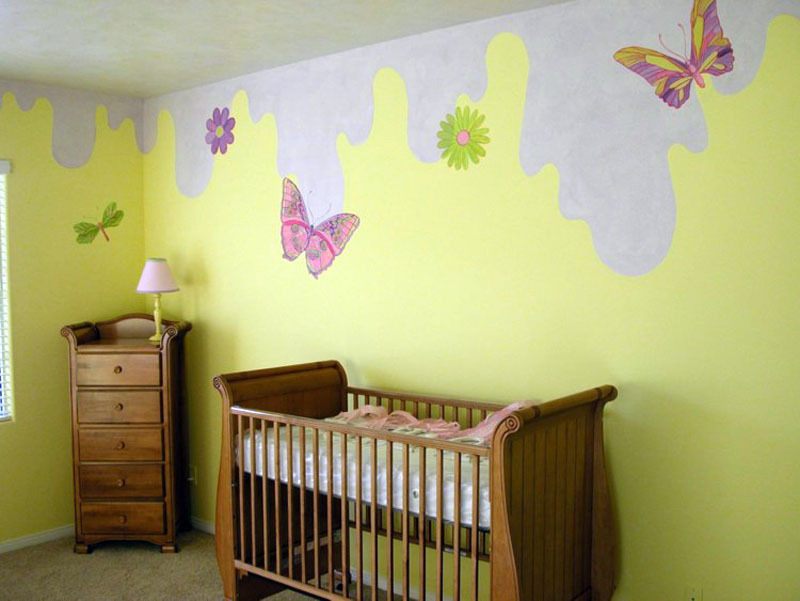 Nursery walls painted with flowers and butterflies. 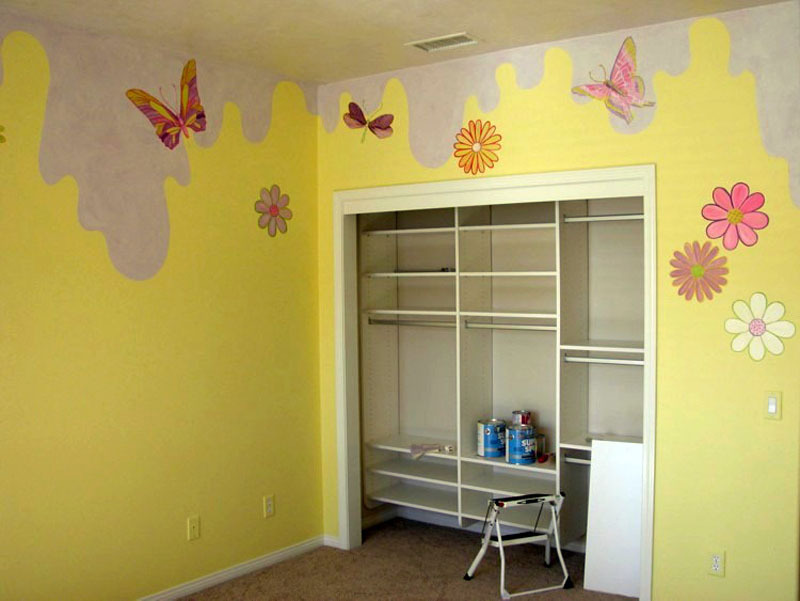 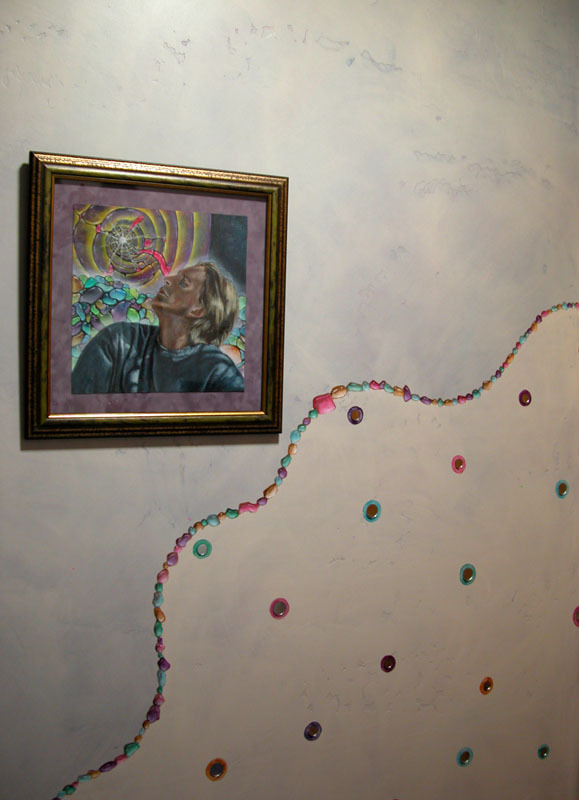 The ceiling drips down onto the walls like melted icing. 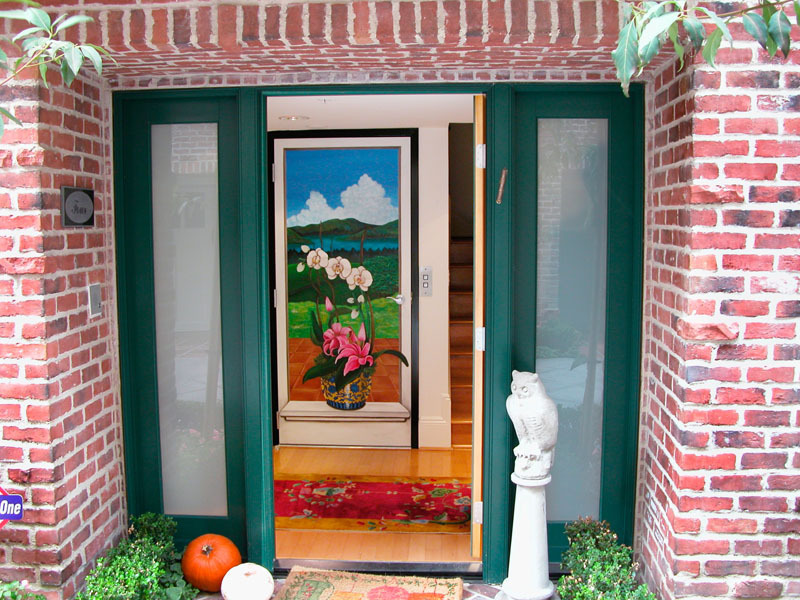 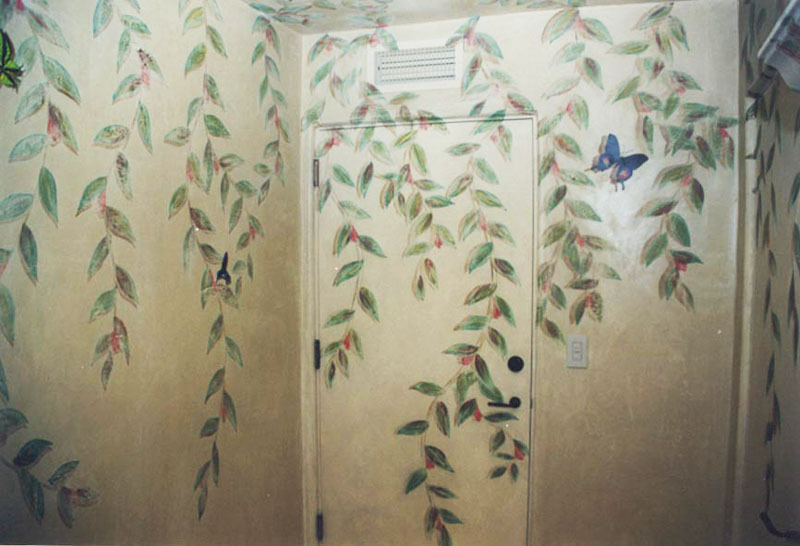 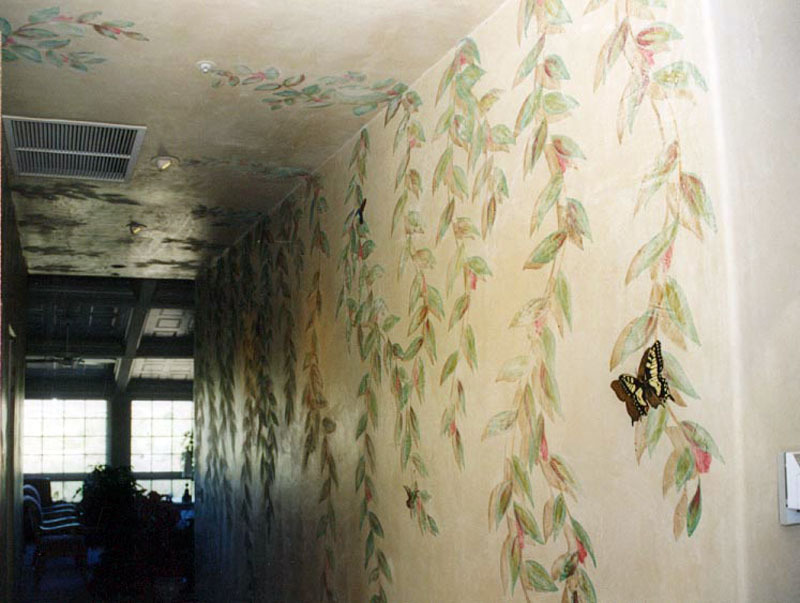 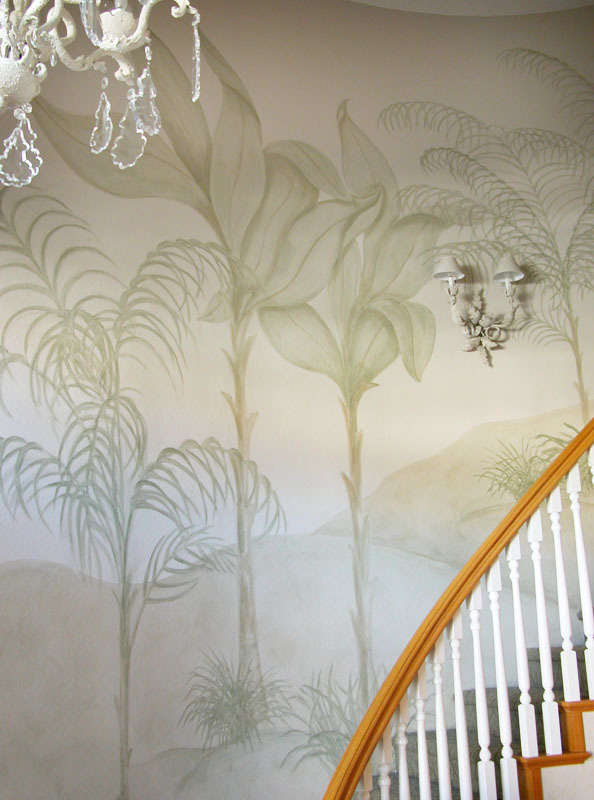 The hallways in this three story home have vines painted on the walls. 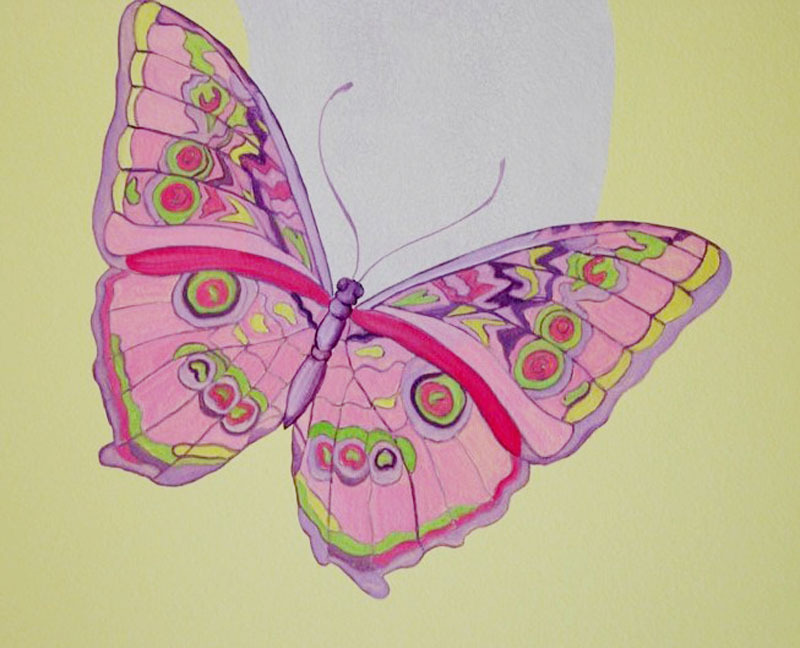 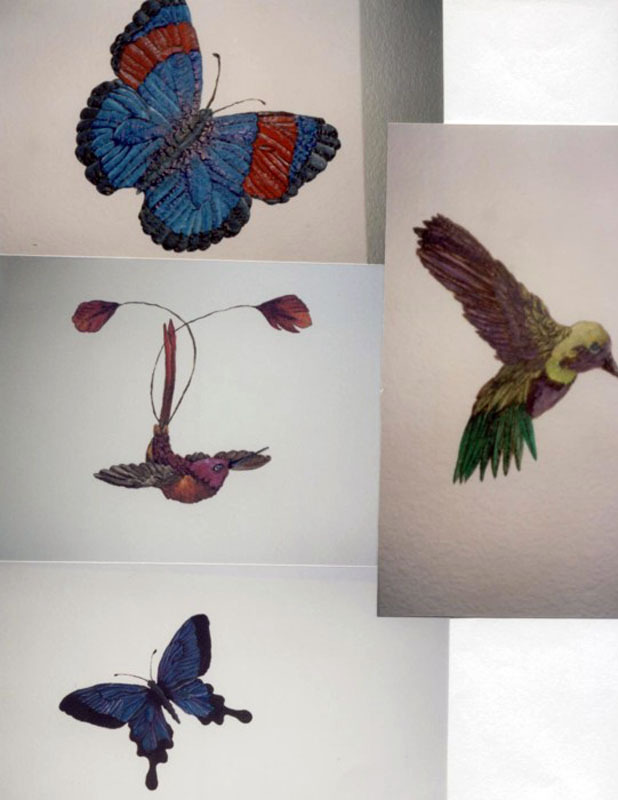 Every now and again there is painted a butterfly or a humming bird. 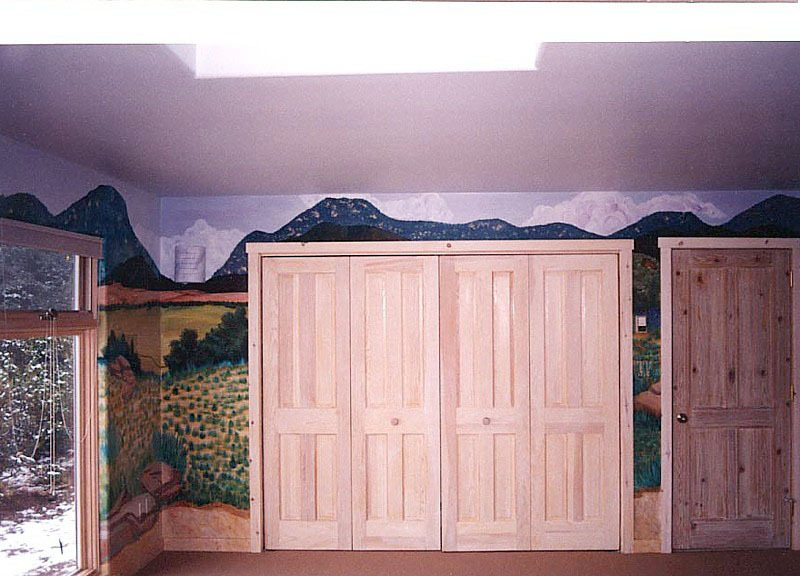 The door, cabinets and drawers in this kitchen are painted with a mural in the style of the artist Magrite. 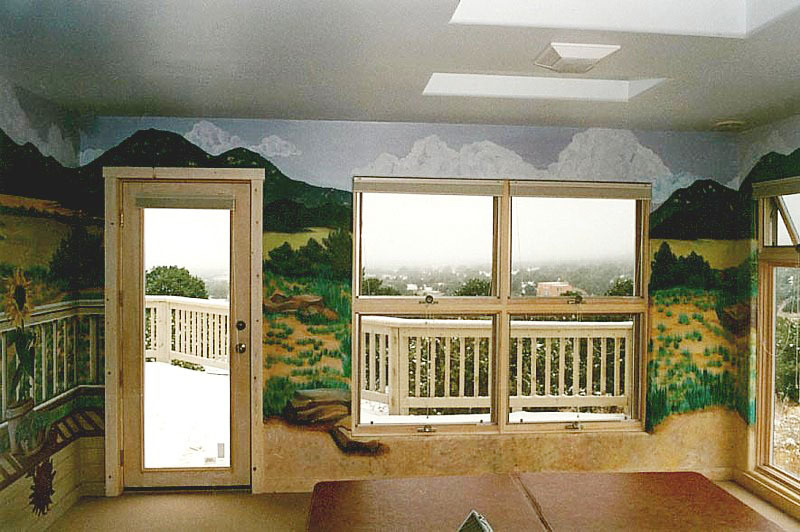 The walls of this indoor spa room are painted with a Southwest landscape. 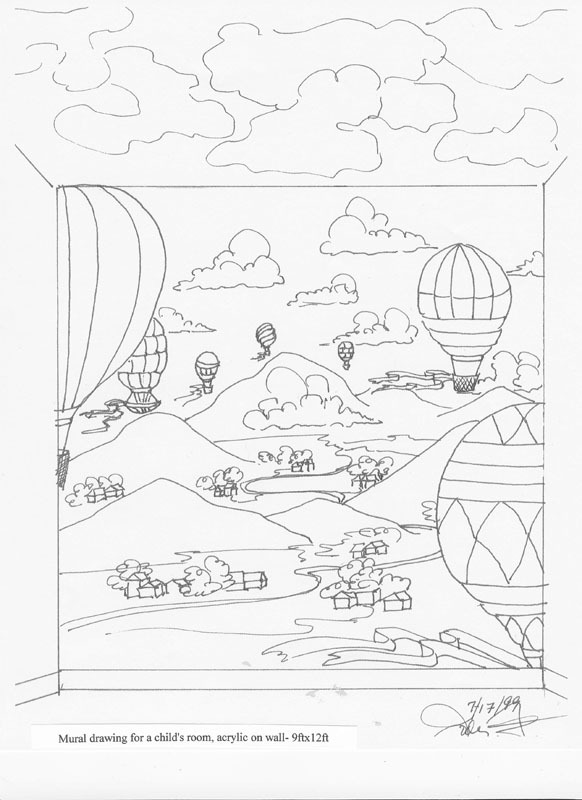 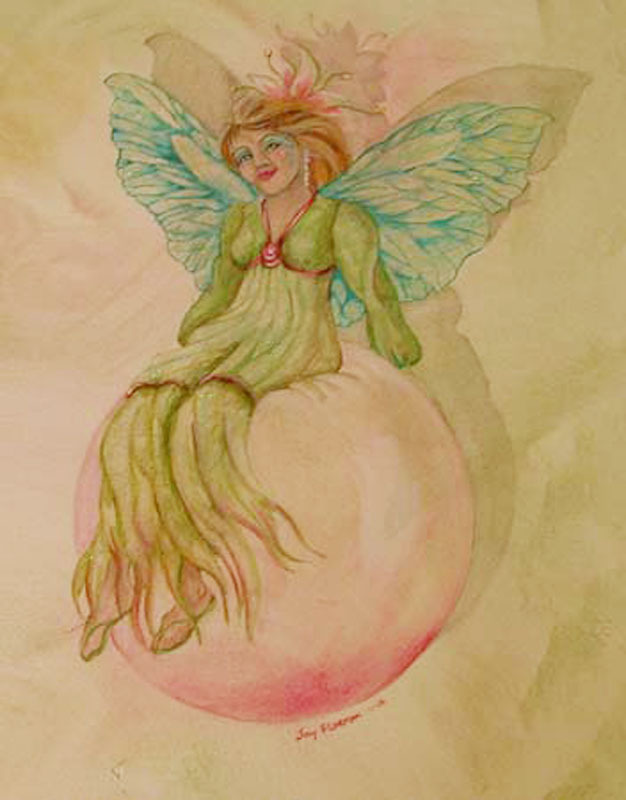 Drawing for a mural in a children's nursery. 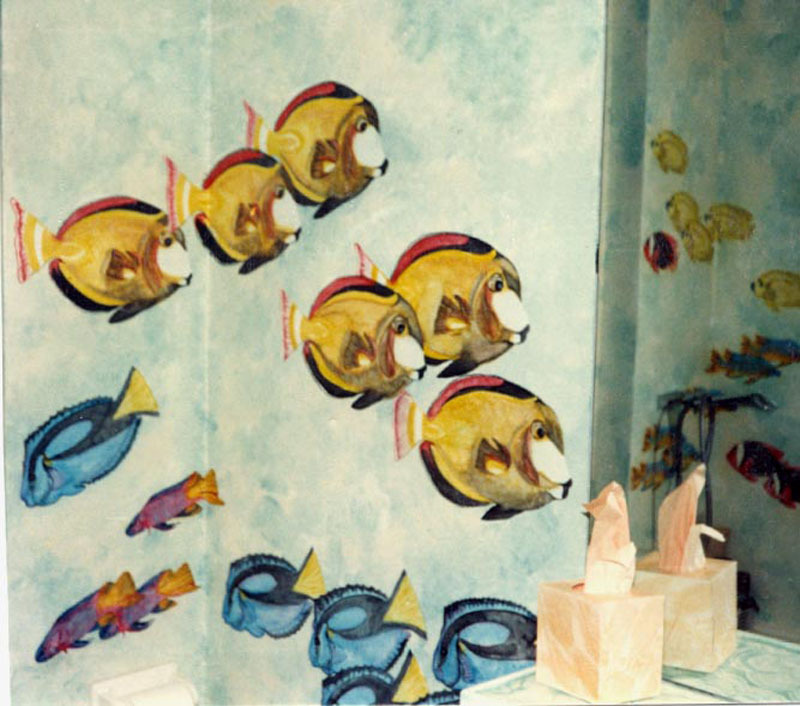 I made this bathroom look like a tropical fish aquarium. 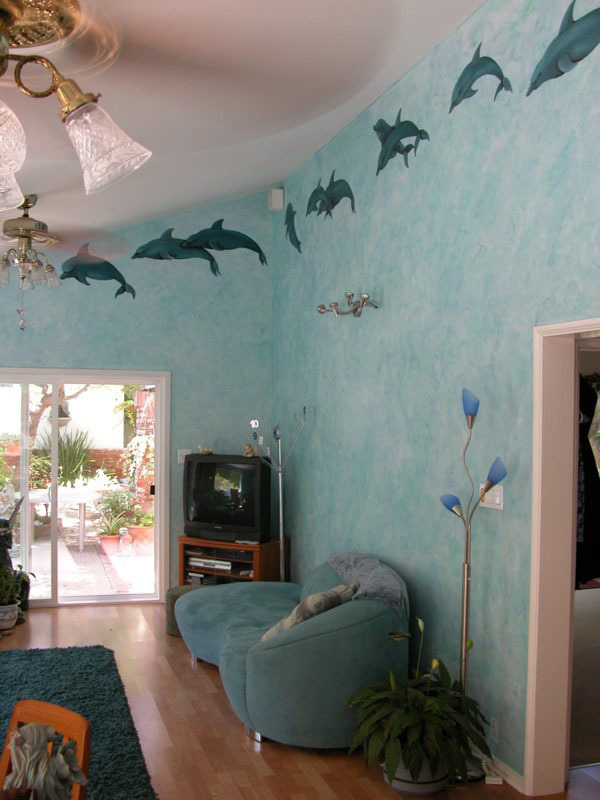 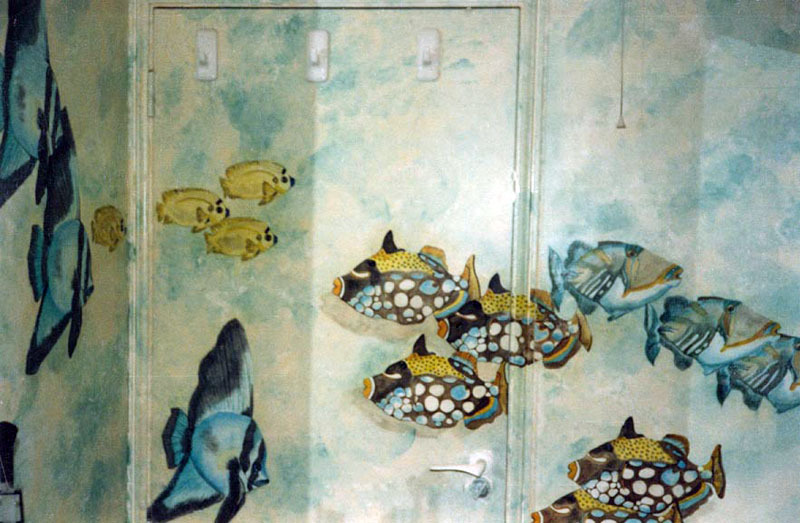 The fish are painted on all four walls.